The Homeschool Convention 2019 is officially open! 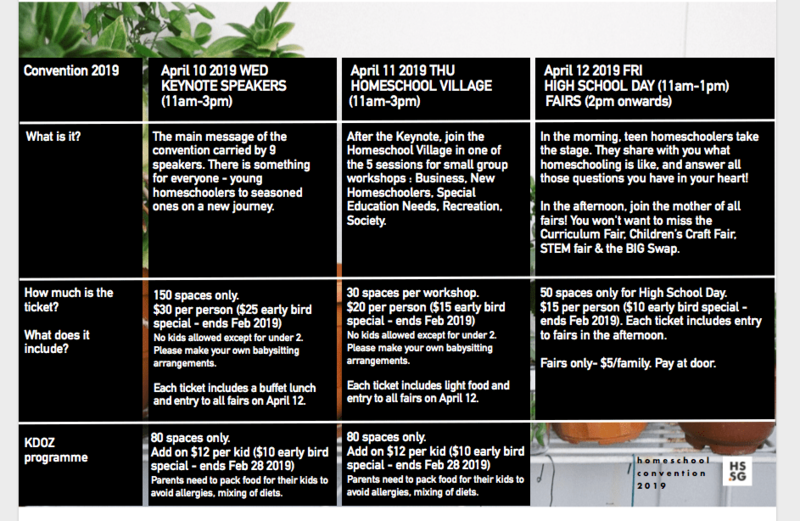 Starting off on April 10, 11am-3pm, is our annual Keynote Speakers session, TED TALK style. 9 inspiring speakers who are fellow homeschooling parents share their hearts on the core messages that will resonate with everyone from new homeschoolers to seasoned ones. Your ticket also includes…a buffet lunch and entry to all fairs. Kick off your anxiety, get a trusty notebook, and join us. Each keynote pass is $30/pax. 150 spaces only. Do get your tickets early as the last two convention’s keynote passes were sold out. Unless you have bought a KDOZ pass, please make babysitting arrangements as the Keynote Speakers session does not permit children into the hall, except babies and toddlers. TICKET SALES IS NOW CLOSED. The Keynote Team Directors are Madeline Ang and Tammy Hitchens. Madeline spoke at the Homeschool Convention 2017, coaches the current team in public speaking and is the final speaker of the Homeschool Convention 2019’s Keynote Speakers session. Tammy is our beloved mum of 13 and parenting coach to all in the team. Tammy and Madeline are mentors, leaders and beloved fellow parents in the community. Audrey has been an educator for the past 20 years – first in the classroom, then in her own family. As she witnessed how children struggled to survive in schools, she began to re-examine the whole mindset about learning and education. With her husband’s full blessing and support, they pulled the plug on their 3 children’s mainstream education journey and entered the world of homeschooling. Audrey will remind us about the basic and perks of homeschooling, regardless of the curriculum we use. Audrey was a speaker at Homeschool Convention 2017, and the organiser of The Big Swap! Kay is married to a public officer and is mother to her three lovely princesses. Growing up in China, she did not imagine that she would end up marrying a Singaporean and living in Singapore, much less entering the home-schooling world – a world she had never dreamed or seen! In her 6 years of home-schooling, Kay has encountered many challenges, experienced new approaches to education and gained fresh perspectives. Kay was one of the leaders at the Chinese Conference at the Homeschool Convention 2018. Grace is mum to 3 beautiful girls aged 11+, 8 and 3+. She has been homeschooling since her eldest was 6, loves Charlotte Mason philosophies of education but uses whatever styles, books and curriculum that inspires her and works for her family. Homeschooling is a continuing education for herself, learning never stops! Grace was the leader of Young Homeschoolers session at Homeschool Convention 2018. Mark is an adventurer in life. He and his wife Sue homeschool two lovely boys, aged 8 and 6, and foster a baby girl, almost 1. Five years ago, Mark quit his full-time job in the education sector, and started his own company. Since then he balances his professional responsibilities as a trainer and counsellor, while at the same time taking on the challenges of a Homeschooling Dad. Life has been harrowing yet fulfilling as he pursues the one thing that matters most – to be the best husband and father he can be. Mark spoke at the Special Needs Forum at the Homeschool Convention 2018. Sophia is a wife to Justus, who had a long military career and now runs their family business. Sophia has 4 very bright and trustworthy children who are well loved in the community. The focus in Sophia’s life is on contentment and an uncluttered family schedule that still allows for balance and spontaneous fun. Sophia has run Mandarin immersion co-ops for 4 years with excellent reviews from participating families. She has great insight into burn out and keys for how to develop healthy boundaries that allow for endurance. Sophia spoke at the Chinese Conference at the Homeschool Convention 2018. Natalie is the wife of an aviation professional and mom of two charming, energetic sons who’ve never stepped foot inside a school. She nurtured the home education lifestyle long before she knew it by name while pursuing her passion for travelling the world with her family. Natalie has earned a BA in Geography, dedicated much of her time to non profit organizations and learned that all things are possible with God. In the quiet, settled moments of her day you’ll find her jogging, reading, tending to her plants or day dreaming of where in the world she will travel next. Catherine is a familiar name in the homeschooling community because she has homeschooled for so long and she is a doula to some of us. She has 5 children, and one more left to take the PSLE. This is her story of how she overcame her challenges and criticisms to be where she is now. Catherine spoke at the Young Homeschoolers session at Homeschool Convention 2018. Eve is mum to 2 boys age 8 and 7. She is Malaysian Chinese. She is a seller of beautiful Chinese illustrated books. More so to us, she is a friend who always seeks reflection in everyday living with her family. This is one of those moments in her life that she will share with us. Eve spoke at the Chinese Conference at the Homeschool Convention 2018. Madeline Ang is a published poet and writer who draws her experiences from lens of gratitude and everyday encounters. She is a mother of two girls. Madeline’s Firstborn is studying in a local university. Her Lastborn is being unschooled and Madeline is relishing in discovering, and learning, new things alongside her child every day. Madeline spoke at the Homeschool Convention 2017, coaches the current team in public speaking and is the final speaker of the Homeschool Convention 2019’s Keynote Speakers session. Follow their stories on the FB event page. Already brought ticket, but where is the venue of the convention being held? hi Albert, check your email. we have already sent the details.